Monday August 13, 2018 - Matatu fares are set to increase by a big margin all over the country. This is after the Government of President Uhuru Kenyatta and his Deputy, William Ruto, introduced a 16 per cent Value Added Tax (VAT) on fuel products beginning next month. However, the move has been vehemently opposed by Matatus who are set to pass over the burden to passengers. 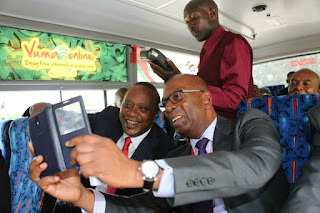 According to Matatu Owners Association Chairman, Simon Kimutai, instead of acting on tax evaders, the Government has decided to levy 16 percent tax on fuel products to collect more revenue. “Additional fares are painful to commuters but the increase in fare prices has to take effect because taxation of fuel translates to an added cost to public service vehicles operators,” Kimutai said. However, Kimutai assured commuters that the increase will be reasonable because it will be based on the calculations of the additional cost. For town services for instance, the Matatu fares increment is expected to be between Ksh.10 and Ksh.20 depending on distance covered. The Consumers Federation of Kenya (COFEK) has opposed the increase of levy on fuel products, terming the move unconstitutional.